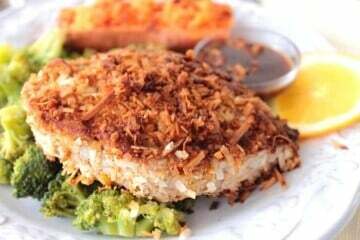 This Tropical Seared Coconut Crusted Tuna Steak was inspired by coconut shrimp I recently had while out to dinner. I’ve paired it with a dipping sauce of orange juice and hoisin, which is the perfect compliment to the mild sweetness of the crunchy toasted coconut crust. It’s quite delicious, and I hope you love it as much as I think you will!